We’ve always liked to make a great first impression. That’s why we put lots of thought into making our window displays that little bit different. Our lovely customers are often commenting on how much they like them, and now it seems our efforts have gained official recognition. The paper birds window display we made last summer, has made it onto the shortlist of the Optician Awards ‘Window Display of the Year’. The display, that was made out of around 200 colourful origami birds, which shimmered and danced with the slightest breeze, caused quite a flutter. Passers by were forever stopping to look at the birds and take photos. Loads of people came into the shop to tell us how much they loved the display and to photograph the birds from inside. Some people wanted to buy the birds; one person even asked if they could have them for their wedding! 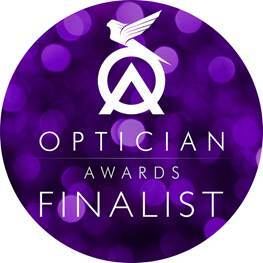 Commenting on reaching the finals, Optician magazine said: “This is a fantastic achievement and recognises the quality and innovative nature of the work you are doing.” Certainly our bold window displays have played a significant part in the growth of the practice. And since we don’t stock the kind of everyday frames you find on the high street, it’s important that our window display is just as fresh and innovative. So, we’re now busily dusting off our DJs and party frocks ready for the glitzy awards ceremony in Birmingham on Saturday 9th April. Keep your fingers crossed!